We planned to use the town of Hinton, Alberta, about an hour east of Jasper, as a base for exploring parts of Jasper National Park. 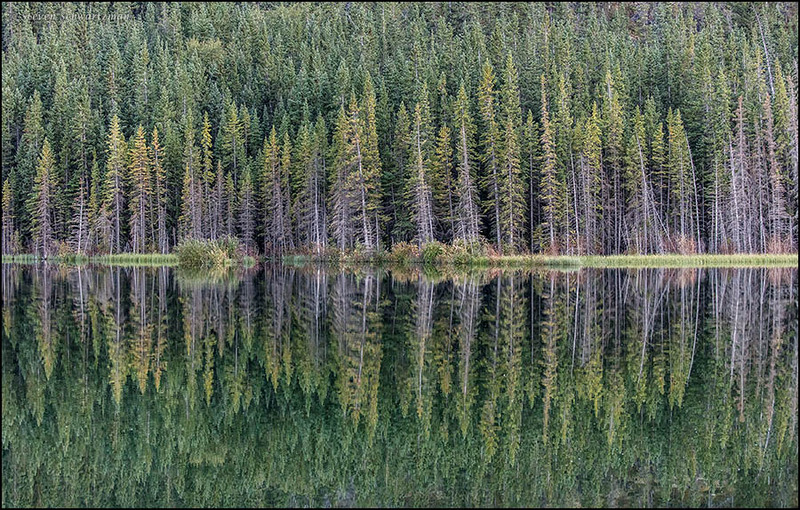 As we headed toward Hinton on Canada Highway 16 early in the evening of September 4th, we passed several ponds on the south side of the highway that caught my attention and made me pull over to see whether I could take some photographs. I say “whether” because it was almost 8 o’clock, the sun had settled below the hills, and there wasn’t much light left. I found that by raising my camera’s ISO to 1600 and using my telephoto lens’s widest aperture of f/4.5, I could indeed get a few pictures. On September 4th we headed north up the Icefields Parkway, often considered one of the most scenic drives in the world. It is. 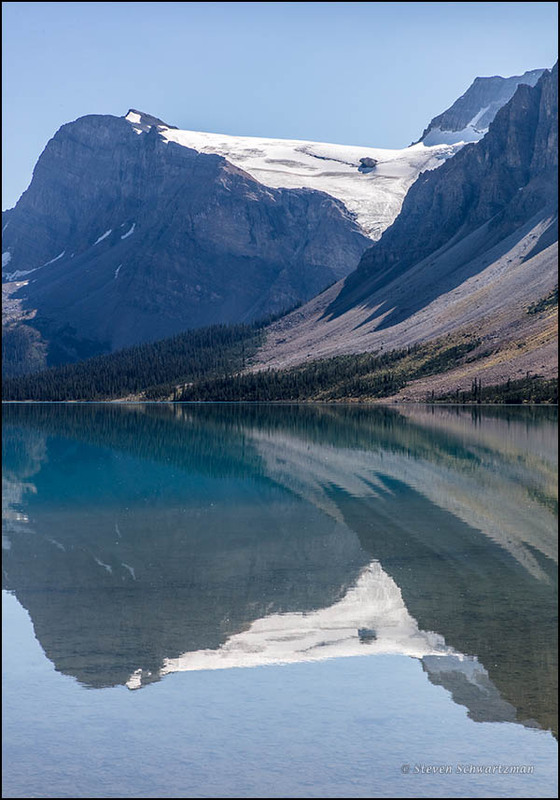 The first place along the route where we spent significant time was Bow Lake, shown here with the Crowfoot Glacier reflected in it. 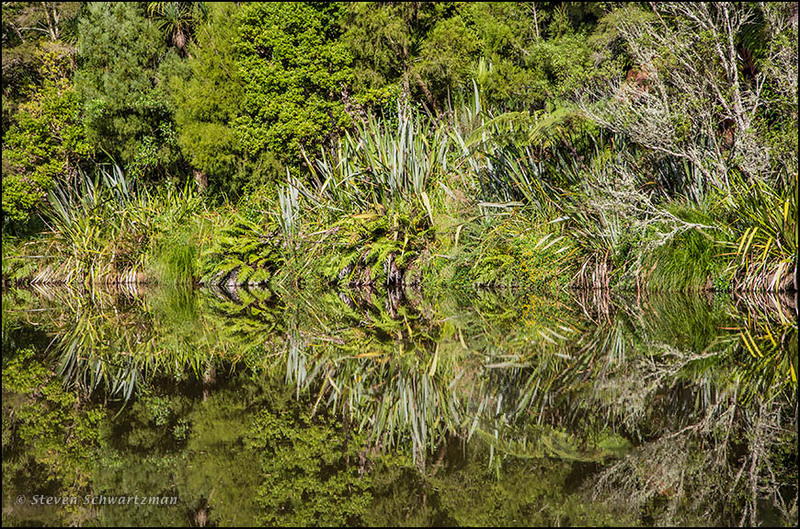 Just because I stopped showing pictures of New Zealand after returning from the big South Dakota trip doesn’t mean you couldn’t have been regaled with more of them. 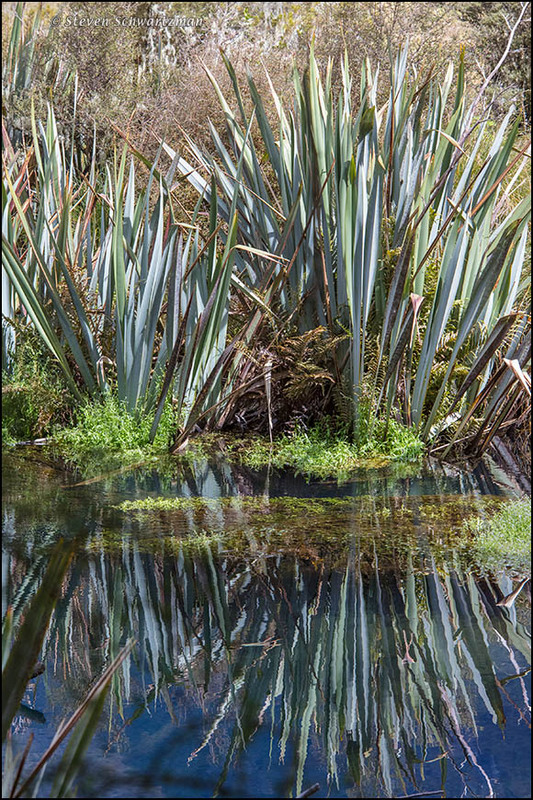 Here, for example, is a view from February 22 showing flax plants reflected in one of the South Island’s Mirror Lakes. No upside-down sign needed. 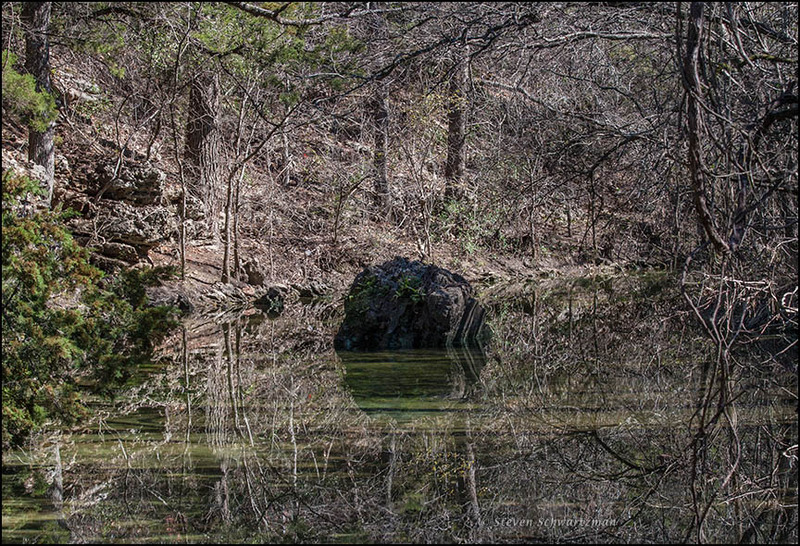 Here’s a vertical winter landscape showing Buttercup Creek in the town of Cedar Park on a mild and clear February 4. The dry grass may have been switchgrass, Panicum virgatum, and it spoke to the previous season, but the black willow trees, Salix nigra, were already rising into spring with reddish new growth in their crowns. Not far away I found some unaccustomed little flowers, about which you’ll see and hear more next time. 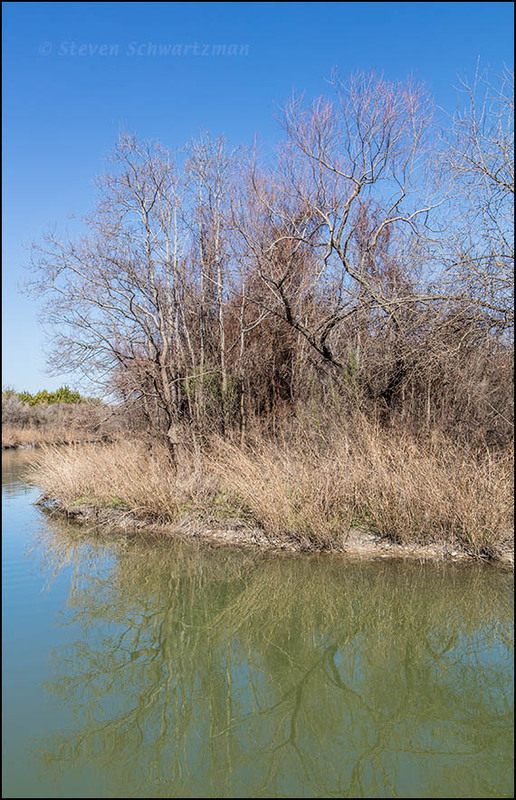 On January 7th I went walking in Balcones Regional Park in north Austin and took a few photographs of Walnut Creek. The pictures turned out just so-so, so here From February 4, 2007—nine years ago today—is a view that I do like of that same part of the creek, primarily because of the superimposed layers in the lower half of the image. There’s the water, and what’s reflected in the water, and the way the shadow of the prominent rock cancels the reflection there. The result is that I feel I’m peering into an opening through a dense lattice of trees, yet I can’t shake the impression that things have been turned inside out, as if I were looking at a stereo pair in which the two halves had been accidentally reversed. On the same August 23rd outing to Meadow Lake Park in Round Rock that led me to the D.D., or dense dodder, I photographed this H.H, or handsome heron, flying low over the lake. 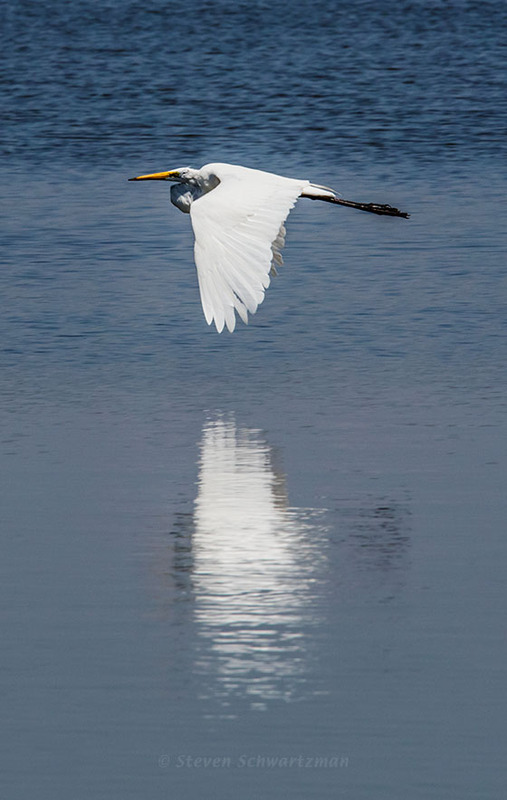 My subject appears to be the largest of the white herons in Texas, the great egret, Ardea alba, where alba means ‘white’ (think of albumen and albino). I haven’t had much success with pictures of an individual bird on the wing, but this one strikes me as not too bad. For the technocrats among you, I’ll add that I panned with a shutter speed of 1/800 sec. to freeze the bird’s motion and used a high enough ISO to yield an aperture of f/16 that would keep the heron sharp in case the focus was a bit off.